Apollo 4, (also known as AS-501), was the first unmanned test flight of the Saturn V launch vehicle, which was used by the U.S. Apollo program to send the first astronauts to the Moon. The space vehicle was assembled in the Vertical Assembly Building, and was the first to be launched from Launch Complex 39 at the John F. Kennedy Space Center on Merritt Island, Florida, facilities built specially for the Saturn V.
Apollo 4 was an "all-up" test, meaning all rocket stages and spacecraft were fully functional on the initial flight, a first for NASA. It was the first time the S-IC first stage and S-II second stage flew. It also demonstrated the S-IVB third stage's first in-flight restart. The mission used a Block I command and service module (CSM) modified to test several key Block II revisions, including its heat shield at simulated lunar-return velocity and angle. AS-501 was the Saturn V's first flight. At the time, it was the largest launch vehicle to ever attempt a flight. This mission was NASA's first to use "all-up" testing, a decision that goes back to late 1963. George Mueller, the head of the NASA Office of Manned Space Flight at that time, was a systems engineer who previously worked on military missile projects, recognized all-up testing was successfully used to rapidly develop the Air Force's Minuteman ICBM program, and thought it could be used to meet Apollo's schedule. Previously, the way Wernher von Braun's team at the Marshall Space Flight Center, and the old NACA Langley Research Center engineers tested new rockets was by testing each stage incrementally. The Saturn V's test program departed from the conservative incremental approach previously used by the Marshall and Langley engineers. It would be tested all at once, with all stages live and fully flight-worthy, including an Apollo command and service module (CSM). This decision dramatically streamlined the program's test flight phase, eliminating four missions, but it required everything to work properly the first time. Apollo program managers had misgivings about all-up testing but agreed to it with some reluctance since incremental component tests would inevitably push the lunar landing mission past the 1970 goal. The mission was the first launch from the Kennedy Space Center Launch Complex 39, specifically built for the Saturn V. Since this was an all-up test, it was the S-IC first stage and S-II second stage's first launch. It would also be the first time that the S-IVB third stage would be restarted in Earth orbit, and the first time that the Apollo spacecraft would reenter the Earth's atmosphere at the speed of a lunar return trajectory. The payload was a CSM, serial number 017. This was a Block I design meant for systems testing, not the Block II spacecraft designed for use with the lunar module (LM) on the actual Moon landings. However, several significant Block II modifications were made for certification, since no all-up Block II spacecraft would fly without a crew. The modifications included a new CM heat shield outer covering; a new CM-to-SM umbilical connector; moving the VHF scimitar antennas from the CM to the SM; a new Unified S-band antenna; and a modified crew compartment hatch. A dummy LM known as a Lunar Module Test Article, LTA-10R was carried as ballast to simulate the loadings of the LM on the launch vehicle. At 29,500 pounds (13,400 kg), the LTA-10R was slightly lighter than a nominal LM used on the first lunar landing, which weighed 33,278 pounds (15,095 kg). The launch of AS-501 was originally planned for late 1966, but was pushed back by stage development problems to April 1967. The first piece to arrive at the Kennedy Space Center was the S-IVB third stage, built by the Douglas Aircraft Company. Small enough to be transported by a specially built plane, the "Pregnant Guppy" built by Aero Spacelines, Inc., it arrived on August 14, 1966. The other stages were much larger and had to travel by barge along the Banana River. The S-IC first stage, built by the Boeing Company, arrived next on September 12 from Michoud, Louisiana. North American Aviation was the contractor for both the S-II Saturn V second stage, and the Apollo command and service module spacecraft. NASA had been experiencing problems with North American's schedule, cost, and quality performance on both programs, severe enough that Apollo program director Samuel C. Phillips sent a team to North American in California in November and December 1965 to investigate matters, and recommend solutions to the program management problems. He published his findings in a report to his supervisor, George Mueller. The S-II development was known to be about a year behind schedule, and the first flight-ready stage did not make its delivery in 1966. In the meantime, vehicle assembly continued, using a huge spool-shaped spacer in its place, in order to gain more experience in the third-stage stack procedure. The S-II did not arrive until January 21, 1967, six days before the fatal Apollo 1 spacecraft fire which killed the first Apollo crew. Upon inspection, cracks were found in the liquid hydrogen tank. These were repaired, the third stage and spacer were removed, and assembly continued with the S-II on February 23. CSM 017 had arrived from North American about a month before the Apollo 1 fire, on December 24, 1966. It had already passed a quality-control inspection, but after the fire that destroyed its sister CM 012, it was subjected to an intensive inspection that found a total of 1,407 errors in the spacecraft. Dozens of haphazardly routed and skinned wires were short circuits just waiting to happen. NASA managers came to see the problems for themselves. Director of Launch Operations Rocco Petrone was said to have cursed; Apollo Spacecraft Program Office manager Joe Shea welled up in tears; and Phillips stood in stunned silence. The CSM was removed from the stack on February 14, 1967, for repair, which required another four months until it was ready to be re-mated to the rocket on June 20. On August 26, the complete launch vehicle finally rolled out of the Vertical Assembly Building (VAB) - more than eight months after the originally scheduled launch date. AS-501 was the first mission to fly under the official Apollo mission numbering scheme approved by Mueller on April 24, 1967. Since the failed first manned flight had been designated Apollo 1 in honor of the crew widows' wishes, and three unmanned Apollo/Saturn IB flights had already occurred, Mueller resumed the numbering sequence at Apollo 4. The vehicle's on-pad, pre-launch tests and preparation practice started in September, and encountered several problems with propellant loading and various equipment failures. These pushed the launch into November, but provided valuable lessons learned on the new vehicle. By this time, North American had been purchased by Rockwell Standard Corporation, so launch support was the first provided under the new name, North American Rockwell. On November 6, the 56½ hour countdown sequence began with propellant loading. In total there were 89 trailer-truck loads of LOX (liquid oxygen), 28 trailer loads of LH2 (liquid hydrogen), and 27 rail cars of RP-1 (refined kerosene). This time the problems encountered were few and minor. Event times from launch to orbit. Two motion-picture cameras were mounted on the thrust structure of the S-II second stage, for verification of proper staging sequence. Similar cameras were also mounted on the second Saturn V flight, Apollo 6. The cameras ran at four times normal speed to show the events in slow motion. The camera capsules were jettisoned soon after the first stage separation, at an altitude of about 200,000 feet (61 km). They then reentered the atmosphere, and parachuted to the ocean for recovery. Both S-II cameras from Apollo 4 were recovered, so there is footage from both sides of the vehicle. Documentaries often use footage of a Saturn V launch, and one of the most used pieces shows the interstage between the first and second stages falling away. This footage is usually mistakenly attributed to the Apollo 11 mission, when it was actually filmed on the flights of Apollo 4 and Apollo 6. 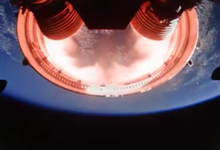 A compilation of original NASA footage shows the jettisoning of the first stage (S-IC) and the interstage, filmed from the bottom of the second stage (S-II), both from Apollo 4. This is followed by footage of the separation of an S-IVB second stage from the first stage of a Saturn IB. The glow seen on the jettisoned stages is due to the hot, invisible hydrogen-oxygen exhaust of the J-2 engines used by the S-II and S-IVB. The footage also shows the more conspicuous plumes of the solid ullage motors as they push the S-II away from the first stage before the S-II engines are fired. The command module contained an automatic 70 mm film camera which captured photographs of almost the entire Earth. For a period of two hours and thirteen minutes as the craft approached and passed its apogee, a total of 755 color images were taken through the Command Pilot's (left-hand) forward-looking window, at altitudes ranging from 7,295 to 9,769 nautical miles (13,510 to 18,092 km). The photographs were not of sufficient resolution to obtain detailed scientific data, but were still of geographic, cartographic, meteorologic, oceanographic, geologic and hydrologic interest. The command module is on display at the INFINITY Science Center, in NASA's John C. Stennis Space Center in Pearlington, Mississippi. ^ a b c d e Saturn V Launch Vehicle Flight Evaluation Report - AS-501 Apollo 4 Mission (PDF). George C. Marshall Space Flight Center: NASA. January 15, 1968. MPR-SAT-FE-68-1. Retrieved July 8, 2013. ^ Orbit to landing entry path would have taken it below the Earth's surface to simulate a high-energy lunar re-entry. ^ "NASA Apollo Mission Apollo-1-- Phillips Report". nasa.gov. ^ Giblin, Kelly A. (Spring 1998). "'Fire in the Cockpit!'". American Heritage of Invention & Technology. American Heritage Publishing. 13 (4). Archived from the original on November 20, 2008. Retrieved March 23, 2011. ^ "VAB Nears Completion". NASA History Program Office. NASA. Retrieved September 25, 2014. The new name, it was felt, would more readily encompass future as well as current programs and would not be tied to the Saturn booster. ^ Ertel, Ivan D.; Newkirk, Roland W.; et al. (1969–1978). "Part 1 (H): Preparation for Flight, the Accident, and Investigation: March 16 through April 5, 1967". The Apollo Spacecraft: A Chronology. IV. Washington, D.C.: NASA. LCCN 69060008. OCLC 23818. NASA SP-4009. Retrieved March 3, 2011. ^ "Apollo 11 30th Anniversary: Manned Apollo Missions". NASA History Office. 1999. Archived from the original on February 20, 2011. Retrieved March 3, 2011. ^ a b Dornbach, John E. (February 1968). 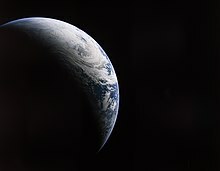 Analysis of Apollo AS-501 Mission Earth Photography (PDF). Houston, TX: Manned Spacecraft Center, NASA. NASA TM X-58015. Retrieved July 8, 2013. Benson, Charles D.; Faherty, William Barnaby (1978). Moonport: A History of Apollo Launch Facilities and Operations. NASA History Series. Washington, D.C.: Scientific and Technical Information Office, NASA. LCCN 77029118. NASA SP-4204. Retrieved July 8, 2013. Bilstein, Roger E. (1996). Stages to Saturn: A Technological History of the Apollo/Saturn Launch Vehicles. NASA History Series. Washington, D.C.: NASA History Office, NASA. ISBN 978-0-16-048909-9. LCCN 97149850. NASA SP-4206. Retrieved July 8, 2013. Brooks, Courtney G.; Grimwood, James M.; Swenson, Loyd S., Jr. (1979). Chariots for Apollo: A History of Manned Lunar Spacecraft. NASA History Series. Washington, D.C.: Scientific and Technical Information Office, NASA. LCCN 79001042. NASA SP-4205. Retrieved July 8, 2013. Brinkley, Douglas (2012). Cronkite. New York: HarperCollins. ISBN 978-0-06-137426-5. LCCN 2011051467. Cadbury, Deborah (2006). Space Race: The Epic Battle Between America and the Soviet Union for Dominion of Space. New York: HarperCollins. ISBN 978-0-06-084553-7. LCCN 2005052693. Hansen, James R. (2005). First Man: The Life of Neil A. Armstrong. New York: Simon & Schuster. ISBN 978-0-7432-5631-5. LCCN 2005049992. Murray, Charles A.; Cox, Catherine Bly Cox (1989). Apollo: The Race to the Moon (1st Touchstone ed.). New York: Simon & Schuster. ISBN 978-0-671-70625-8. LCCN 89006333. Neufeld, Michael J. (2007). Von Braun: Dreamer of Space, Engineer of War. New York: Alfred A. Knopf. ISBN 978-0-307-26292-9. LCCN 2007005711. Reynolds, David West (2002). Apollo: The Epic Journey to the Moon (1st ed.). New York: Harcourt. ISBN 0-15-100964-3. LCCN 2001051930. Ward, Bob (2005). Dr. Space: The Life of Wernher von Braun. Foreword by John Glenn. Annapolis, MD: Naval Institute Press. ISBN 978-1-591-14926-2. LCCN 2005002561. Woods, W. David; MacTaggart, Kenneth D.; O'Brien, Frank. "Apollo 11, Day 1, part 1: Launch". Apollo Flight Journal. Washington, D.C.: NASA. Retrieved July 8, 2013. 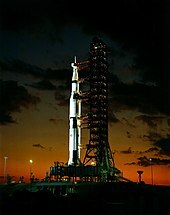 Wikimedia Commons has media related to Apollo 4.